Individual fruiting bodies of Exidia glandulosa fuse together and, like something out of a bad science fiction movie, spread across sticks and small branches of hardwoods. The result is a large, quivering, black patch of gelatinous globs that eventually dry out, leaving a blackish crust on the wood. 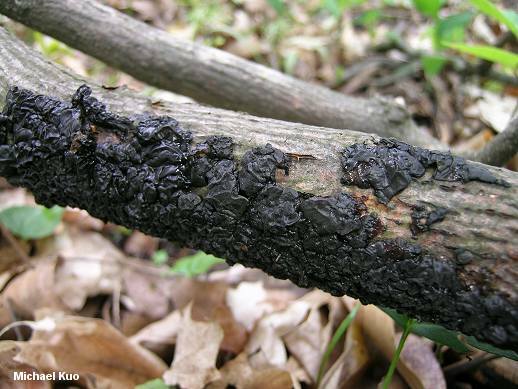 Exidia glandulosa prefers cooler temperatures, usually fruiting in spring (when it is often encountered by morel hunters) and fall. Ecology: Saprobic; growing on recently fallen hardwood sticks and branches (especially on the wood of oaks); commonly encountered in most areas in spring and again in fall, but not infrequently appearing during summer cold spells or winter warm spells; widely distributed in North America. 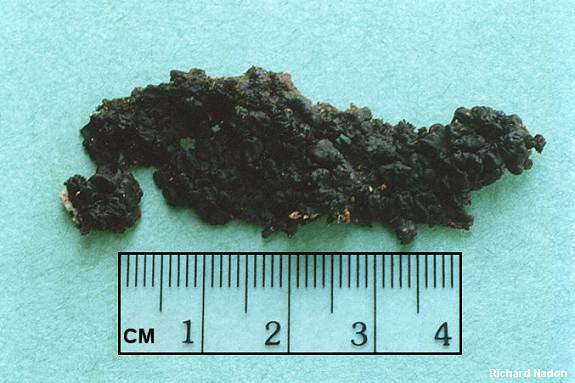 Fruiting Body: Individual fruiting bodies are 1-2 cm across, but are typically fused into large patches (often over 50 cm long); gelatinous; lobed and brainlike; reddish black to black; surface smooth or slightly rough. Microscopic Features: Spores 10-16 x 3-5 µ; sausage-shaped; smooth. Basidia longitudinally septate (cruciate), with sterigmata to 65 µ long. Clamp connections present. REFERENCES: (Bulliard, 1789) Fries, 1822. (Saccardo, 1888; Lowy, 1971; Arora, 1986; Lincoff, 1992; Metzler & Metzler, 1992; Barron, 1999; Roody, 2003; McNeil, 2006; Miller & Miller, 2006; Binion et al., 2008.) Herb. Kuo 04230401, 04230402, 05030409, 04270707.